Whether you’re in town to visit family, or always in the area, don’t forget to #shopsmall this season. From newly-opened to well-loved staples, we highlight just some of Grove City’s unique holiday shopping and adventure experiences you can gift your loved ones. Broadway Fireplace and Décor is the latest in the collection of home décor shops that can be found in Grove City. If you want to make your home a little warmer for the holiday season, they also design and install custom fireplaces and stoves. They are open 10:00am – 7:00pm on Black Friday for holiday shopping, with 10% off your total in-store purchase. Between the hours of 10:00am-1:00pm, the first five customers will receive a candle, while the first 25 customers will have their names put in a drawing for $25 in store credit. Transcend Coffee + Roastery has green brews galore to keep you warm during your holiday shopping adventure. While you’re there, pick up a bag of responsibly sourced coffee beans or two to delight and excite any coffee lover in your life! If you’ve worked up an appetite from all that holiday shopping, take a bite out of 3 Brothers Diner. This Mexican-American Fusion spot can also cater, perfect for your upcoming Christmas party! Can’t find the perfect gift for the hard to shop for on your list? Board and Brush Grove City offers guided classes to help you customize and handcraft one-of-a-kind Christmas gifts. Or, pick up a gift card for creative types to go DIY their own masterpiece. Looking for more ways to give homemade gifts? AR Workshop offers classes to teach you how to make wood signs, pillows, totes, and centerpiece boxes. Their Grand Opening is coming up quickly on December 2nd. Never Grow Up Boutique will offer some light snacks all day for the little ones along with gift wrapping options for all your holiday purchases. For their Small Business Saturday event November 25th, they’ll also be host to a drop off station for the Grove City Food Pantry’s Holiday Season stock up. Plan to donate four non-perishables and you’ll score a coupon to use for your holiday shopping! Warm up by getting a workout at LVL UP Sports on Black Friday where they’ll have savings on paintball gear from DYE, Planet Eclipse, Virtue, HK Army, Empire, GI Sportz, Valken, Exalt and more! Black Friday also means discounted open play from 10:00am – 5:00pm where players will save $10 on any package ($40 for entry/air/case members only). Plum Run Winery is participating in the Stuff the Stocking “Capital City” Wine Trail on Black Friday. Sample wines and enjoy a complimentary appetizer. This trail can also be done December 1st, December 2nd, December 8th and December 9th. The first 50 people to walk in Country Hearth Primitives on Black Friday from 9:00am – 12:00pm will receive a free gift. The store will remain open until 7:00pm with other special sales. They will also be open for Small Business Saturday. With four levels of antiques, primitives and handmade goods, Country Hearth Primitives is a holiday shopping hub! The Farm Table will be open from 3:00pm – 12:00am on Black Friday for snacks, music and discounts, how much more fun could holiday shopping be? Their Black Friday Midnight Shopping party also includes 25% off from 9:00pm – 12:00am (exclusions do apply). Tartan Merry Christmas pillows and table runners are back in stock but not for long!!! Stop in today. Also 25% off all Children's Line and receive a $10 coupon with any purchase. Good for Black Friday!!! Lots of new today!!! Whether you get your heart racing with a game of paintball while you shop for thrill seekers, or have heartwarming conversation during a coffee break in Grove City Town Center, we hope you have an amazing holiday shopping adventure in Grove City! What are your favorite Grove City spots for holiday shopping? 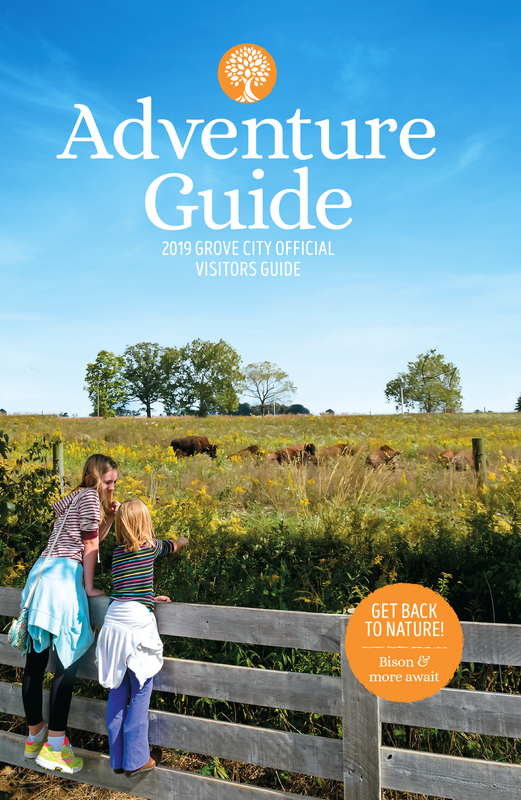 Share with us on social media using #visitgrovecity + #altogetheradventure! Disclaimer: While we try our best to post correct and up-to-date information, this does not guarantee accuracy. Please contact individual shops for store hours and specials.